When you're in the mood for ham with all the fixings but don't want to wait all day for a whole ham to roast, a steak is the perfect solution. Ham steaks are thick, juicy and surprisingly low in fat and calories. Three ounces of a boneless, cured ham steak has only 105 calories and just over 3 grams of fat. Ham is also protein-rich with almost 16 grams per 3-ounce serving. Unfortunately, ham steak is incredibly high in sodium, with over 1,000 milligrams per serving, depending on the brand and preparation. 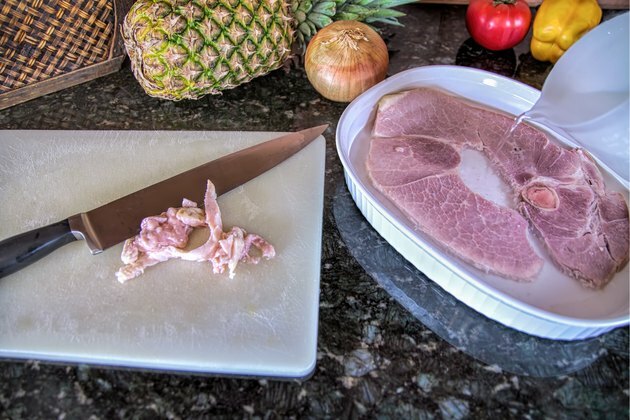 Healthy adults should save ham for special occasions, and individuals with heart disease and high blood pressure should avoid ham steaks altogether. Place the steak on a cutting board and use a sharp knife to trim away skin and fat. Move the steak to a pie plate or shallow casserole dish and cover with an inch of cool water. Put the dish in the refrigerator overnight or for at least six hours. The water bath will leach some of the sodium out of the steak, improving its nutritional value. Remove the steak from the water bath and pat it dry with several paper towels. Put a skillet on the stove over medium heat. Spray the skillet with a little nonstick vegetable oil spray. Cook the steak until brown and crispy on both sides. If you are cooking more than one steak, do them one at a time to ensure each is cooked evenly. The length of frying time will depend on the thickness of the steak. Allow the steak to rest in the skillet for three minutes if it was a raw cut. 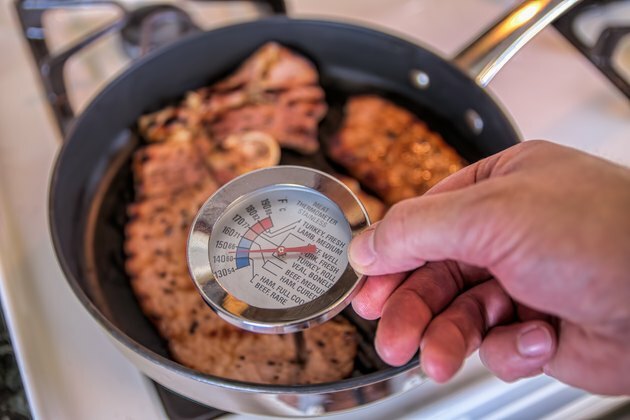 Check the temperature with a thermometer to ensure it has reached a safe 145 degrees Fahrenheit. Precooked steaks don't need to rest, but should have an internal temperature of 140 degrees Fahrenheit according to the U.S. Department of Health and Human Services food safety guidelines. 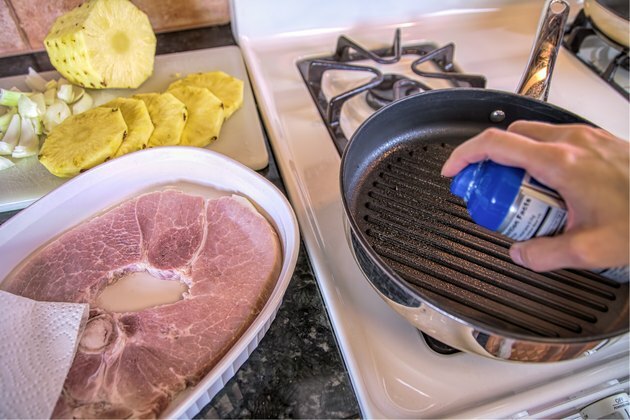 Pair ham steak with a sweet side such as grilled pineapple slices, sauteed apples and onions, fruit chutney or mashed sweet potatoes. 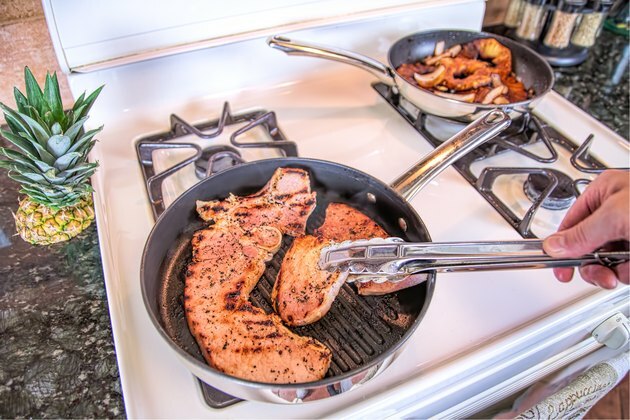 Cover the skillet with a screen to protect yourself from spattering oil.